The Requirements Management CoP has grown exponentially and will continue to do so, especially since the PMI recently announced the new Professional in Business Analysis certification (PMI-PBA). This growth was reflected in the full webinar room during the live event. During the webinar, I shared requirements discovery and delivery principles and practices along a gradient from traditional to agile. Whether you are agile or more traditional, your challenge is the same: In order to remain relevant in today’s market, you have to discover and deliver the right thing at the right time. To do this successfully, you need to elicit customer needs and quickly choose from among many competing voices and options to determine what is truly essential and what can wait for a future release. That means selecting the requirements development and management activities that are most effective for your particular situation–whether those practices are in your current toolbox or not. To understand this mindset shift, it might help to think of requirements activities in terms of the ShuHaRi progression, with a learning stage (shu), a breaking away stage (ha), and a transcendent stage (ri). “Fast, easy, free/cheap…” That’s what we heard about publishing an eBook edition of a paper book. After all, people said, how difficult can it be to take a PDF and make it digital? Quite difficult, actually. 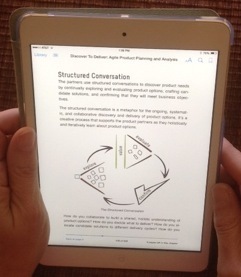 Ellen Gottesdiener and I should have anticipated that publishing eBook editions of our paper book Discover To Deliver: Agile Product Planning and Analysis would be a complex endeavor. In our careers, we have been involved in re-platforming software products (applications)–and we’ve rarely encountered a re-platforming project that is straightforward. Our eBook editions were no exception. Even before we published the paperback version of Discover To Deliver, folks requested a digital version. We analyzed the profile of our primary readers. Challenges in converting the book’s visual language, illustrations, models and examples for a virtual reading audience worried us. Other concerns included the evolving eBook industry, its splintered standards, and the end-product usability issues driven by the increasing variations in devices (tablets, readers, smartphones) on which people access books. Weighing the value proposition of paper vs. digital, we decided to initially go paper. 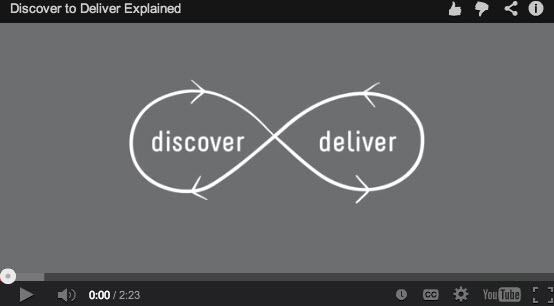 We’re excited to announce the release of “Discover to Deliver Explained.” This two-minute video provides an animated overview of the key concepts in our book Discover To Deliver: Agile Product Planning and Analysis. You asked for a short synopsis of Discover to Deliver concepts that you could share with others. This video offers a quick, easy-to-follow explanation of the 7 Product Dimensions, product partners, the structured conversation, and the Now-, Pre- and Big-View, as they relate to agile requirements. We’re launching something new at next week’s Building Business Capability Conference (BBC): An Open Jam on Agile Analysis and Product Management. Whether you are new to agile or have been on your agile journey for a while, this Open Jam offers you a chance to exchange experiences, explore new ideas, and share struggles with like-minded colleagues. The best part? You don’t have to miss the regularly scheduled sessions to attend and you suggest and participate in the topics that interest you. Let me explain. For the past several years, I have had the privilege of chairing the Agile Summit portion of the Project World/World Congress for Business Analysts. I hope you were able to join us last month in Orlando. We had a tremendous turnout and enjoyed our time learning and networking with each other. 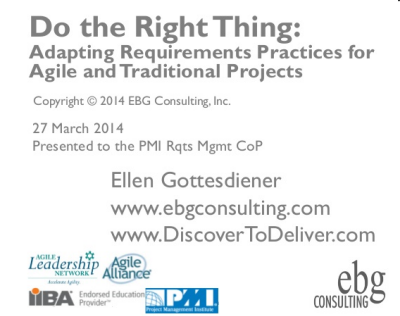 Since then, I’ve had several requests for a summary of my half-day tutorial with Ainsley Nies, “An Agile Approach to Project and Products” as well as the Agile Summit presentation “Got Value? A Practical, Sustainable Value Model for Making Agile Product Decisions” and the track session I gave: “It’s the Goal, Not the Role: The Work of Agile Project Management and Business Analysis.” I wrote up a quick synopsis of all three, along with some suggestions that you can try in your next planning or retrospective session. 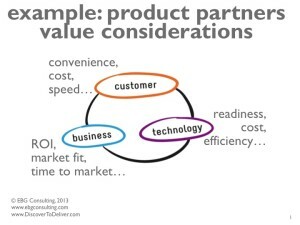 As I prepare to deliver my tutorial (“The Essential Product Owner”) and presentation (“Product Roadmaps: Collaborating to Deliver Value”) at Product Management Festival in Zurich later this month, I wanted to share with you an excerpt of an interview with Mary Gorman and me that was recently published on their blog. During the interview we talk about what inspired Mary and I to write our book, Discover to Deliver, what problems this book intends to solve, target audience, the background on the 7 Product Dimensions, how structured conversations are different from normal elicitation conversations, and more. We talk a lot in the lean/agile community about the crucial importance of the “product owner”—the Scrum term for the person who has ultimate responsibility for the product. Indeed, this person is the champion of the product—and that’s why I prefer the role name “product champion.” You need this person for any type of product (software, system, service, or a combination) and for any context of usage (whether your product is sold commercially or is used for internal IT). 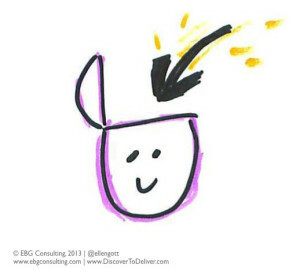 Last time, I told the story of a team that experienced a breakthrough after clarifying the scope of a stalled project. Noting that scope creep—the unrestrained expansion of requirements as the project proceeds—is cited as one of the top project risks, I promised to describe some of the good practices that help product partners manage product scope in a disciplined way. With clients, I always stress the importance of developing a product vision, identifying goals and objectives for the product, and clarifying the product partners’ value considerations very early in the project before development proceeds. Let’s look at ways to do that.